Usually I don’t have to worry about games shattering my childhood memories, since Hollywood already does such a good job of it, and in the case of So Long Oregon!, I get to take a trip down memory lane by dropping too much acid. First thing to note about the game is that the controls are awful on purpose. If you’ve played Enviro-bear 2010, this will come as no surprise, as the psycho moon physics and deliberately horrible response rate fits with the overall retro-wacky feel of the game. 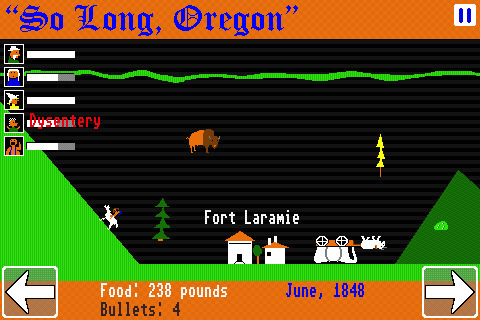 With MS Paint-style graphics likely worse than the original Oregon Trail, this time around you are driving your hapless pioneers to the mythical city of gold, El Dorado, because wouldn’t you rather be rich than have a pile of dirt? Unlike the original, however, the game plays like a schizophrenic platformer. You start off with the unusual choice of traveling from right to left. It will be a challenge to keep your wagon from flipping upside down, as you move, thanks to hellishly uneven digital terrain, and you can expect for at least someone to catch ill or get bitten by a snake along the way. There is the occasional town to encounter, where you have a choice of visiting the doctor to cure an ailment or have everybody just rest for a few days. You don’t have a lot of food and only so many bullets, so time is generally of the essence. You can hunt along the way, but it’s not easy, and you’ll want to try to conserve bullets to scare of bandits and the like. It’s also worth pointing out that unlike in the original, it’s not enough to just reach your destination. Once you find El Dorado, you have to cart that gold all the way back too, which is even more difficult, since you’ll be doing it backwards. Hopefully it’s obvious that you shouldn’t come in to So Long Oregon! expecting a well-crafted and beautifully polished homage to a much-loved favorite. This is more like nostalgia on crack. You’ll get a kick out of seeing familiar sights and elements, but the gameplay is totally different and utterly insane to boot. 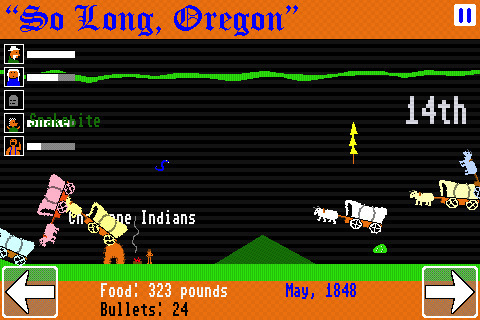 There is a slightly less crazy “Oregon Trail” mode, which is closer to the original, but with the same bonkers style. All the levels are randomly generated, so there’s a fair amount of replay value to the game, but the spectacularly horrible controls will probably temper any unbridled enthusiasm for the game. Bottom line: If you like your daily dose of gaming crazy with the scent of retro nostalgia, check out So Long Oregon! AppSafari review of So Long Oregon! was written by Tracy Yonemoto on August 23rd, 2010 and categorized under Action, Adventure, App Store, Games, iPad apps, Physics Based, Platformer, RPG, Strategy, Universal. Page viewed 3245 times, 3 so far today. Need help on using these apps? Please read the Help Page.